The Enorm Z geometry is a very aggressive cutting geometry with elevated rake and relief angles is suitable for a multitude of long-chipping materials. 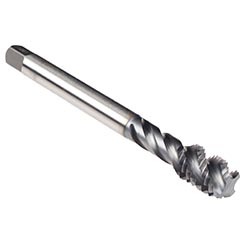 It is designed especially for CNC-controlled machine tools. 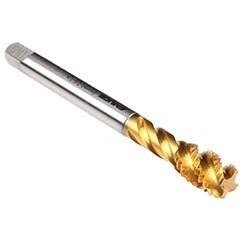 Synchronous feed control, especially in combination with Emuge's collet holders of the Softsynchro® series, will bring out the full performance potential of these tools. For Stainless Steel material, Emuge recommends the Z-Tap with GLT-1 high performance coating. GLT-1 coated Z-Taps produce consistent, controllable chip formations that are ejected smoothly and efficiently from the tap. GLT-1 has a unique multi-layer structure with an anti-friction top layer. The wear and heat resistance of the coating combined with the outer ant-friction layer produce a longer lasting tool that requires less torque and produces superior thread finish qualities. 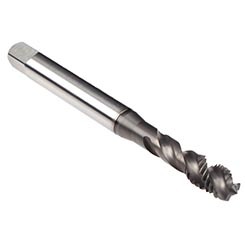 The Enorm Z tap is designed for blind hole threads in long-chipping materials. The fast spiral flutes provide good chip removal from the blind hole. Depending on design and size, threads up to 3 x D can be cut. 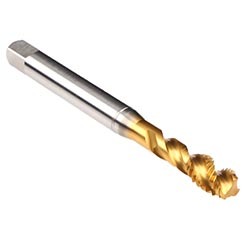 Not to be recommended for threads beginning with an increased diameter.